We are excited to host two dietetic interns during March, which also happens to be National Nutrition Month®! Here is Grace, sampling a healthy chili recipe you can make at home with only a few ingredients. A healthy and hearty chili recipe. Serves 6. 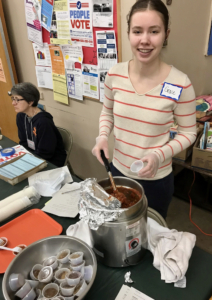 Intern Grace Maples handed out samples of her chili along with the recipe and spices so our shoppers could make it at home! In a large pot, heat oil over medium heat. Add onions and spices. Stir together and cook until soft, 3 to 4 minutes. Mix in beans, tomatoes with juice, and corn. Bring mixture to a boil, then lower heat and simmer for 30 minutes, stirring occasionally. Nutrition Information per serving: 240 Calories, 325 mg sodium, 8 g fat, 1 g saturated fat, 36 g carbohydrate, 9 g protein. Are you interested in cooking, but have a tight budget or don’t know how to start? Check out this free online cookbook Good and Cheap. Created by a graduate student for her capstone project, these recipes are designed for a $4/day FoodShare (SNAP) budget.